Discussion in 'Java Edition News' started by rubik_cube_man, Feb 28, 2019. This has been a challenging week in which we have achieved a lot, however we're really excited to be releasing an Achievements and Challenges update! Introducing new features, menu designs, statistics and much more, you'll love obtaining achievements and challenges in the future, read below and let us know what you think! We've completely redesigned the entire achievements system. This new system allows us to add a lot more achievements than we were previously capable of handling. 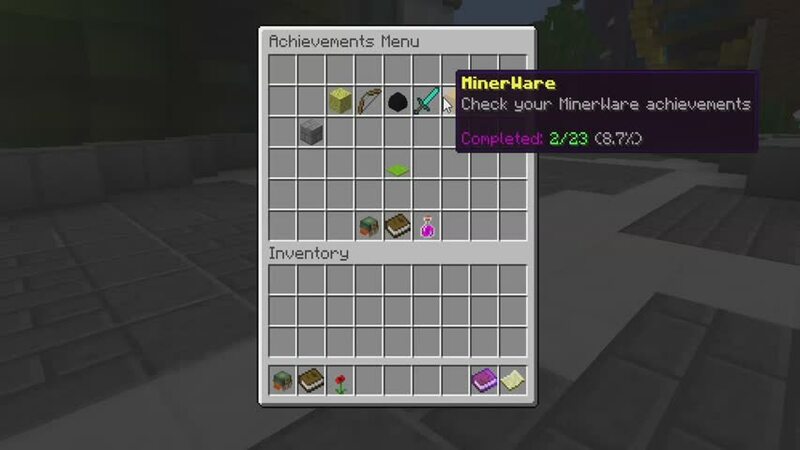 All achievements are split up into multiple categories which are able to be navigated around by clicking on the pages in the bottom left of the menu. A new feature which has been added is the fact that you can now track your progress towards completing achievements. Another neat little feature which we've added is all the achievements now have a difficulty. This is a guide of how hard/long it will take to complete that specific achievement, meaning that if you want to gain some quick achievements you can go for the easier ones, but if you're looking to complete 100% of the achievements, you'll be able to do so by going of some of our ridiculously hard achievements. We've added statistics on how many achievements you've completed. Want to compete with your friends to get the most achievements? Want to get 100% of achievements? Well tracking your progress (and boasting how good you are) is much easier! We've also completely reworked our entire challenge system too. But implementing more information about the daily challenges, changing icons and adding so many new features! Yay! The new daily challenges show you everything that they used to, but now include a very useful timer, which counts down to tomorrows challenge, so you now know how long is left to complete that daily challenge. We've added some more menus into the challenge system. You can now see a full breakdown of the games that you need to play to complete the challenge. Clicking on these while in a lobby will send you directly into one of these games. Wait?! Did I do the easy daily challenge yesterday!? Well, no worries! You can now check how you performed at the last 30 days of challenges, in our fancy new daily challenge history menu! We heard you wanted a /challenges and /achievements command... So... We added them! You can now use those commands in the lobby, in the middle of a game or basically anywhere in the network. The awesome part about it, is that they live update! If you're in-game and you want to see how close you are to an achievement or what challenges you can complete, simply enter the command, the menu will appear and you can browse freely. As usual, for the past month whilst we've been making awesome changes to the achievements and challenges, we've also been improving the rest of the network. With the help of the bug reporting community, most of our developers have been able to crack down on them pesky bugs. If you know of a bug on our network, report it here. - Completely redesigned the new achievements menu. - Clicking on an achievement message when you complete an achievement will open the menu onto the page with the achievement. - The feature game inside the achievement menu will update instantly when a new game appears. - New progress bars on certain achievements. - Achievements all now have a difficulty guideline. - You can now see how many achievements you've completed overall (and in specific games). - Challenges have a timer to when they'll change, so you can see how much time there is left to complete it. - Challenges now have a breakdown of each of the part of the challenge, and clicking on each part will put you in the required game. - There are now streaks inside challenges. Whats the longest streak you're going to get? - The settings menu has had some small tweaks to make it look more similar to menus around the rest of the network. - Fixed the settings menu when sometimes the book at the bottom closes the menu, rather than going back to the profile menu. - Added daily challenges for MinerWare. - The profile menu has been simplified so that everything (achievements, challenges and settings) are all together and uniform, rather than having multiple layers of inconsistent menus that you needed to travel though. - Landing on a Hay Bale now decreases fall damage by 80% (1.9 only - vanilla behaviour). - Fixed an issue with players being able to duplicate items in specific parts of the map. - Fixed an issue with players being able to obtain empty buckets. - Fixed an issue with the egg particles not matching the team colour completely. - Fixed an issue with the arena size on the Team map Orc being too small. - Fixed an issue with dead players/spectators getting kicked for being AFK. - Fixed an issue with the egg particles staying after the egg has already been destroyed. - Removed a block that was in the wrong place on the Kong map. - Fixed an issue when breaking Obsidian with Stone Pickaxe w/Efficiency 1, it now will break the block. - Enderpearl fall damage is fixed (Players now receive it). - Fixed an issue with a hole in one of the paths on one of the maps. - Fixed an issue with the Necromancer tower path 2 saying that it's path 1. - Fixed an issue with the maps Pandora Falls and High Hills from starting. - Fixed an issue with voting options changing mid game if the voted player leaves. - Fixed an issue with Blazes getting stuck at the start on High Hills. - Your stats now save if you leave a game before it ends. - Added a secret room in the lobby (Java and Bedrock). - It caught fire. - Then we fixed it. - Fixed an issue with the arena being surrounded with flatlands. - Fixed an issue with the Gunslinger achievement not working. - Fixed an issue with duel rematches not resetting player saturation. - Fixed an issue with players being able to place water outside of the arena. - Fixed an issue with "Best Killstreak" not being loaded in the sidebar. - Fixed an issue getting TP'd back when using an Elytra. - Fixed an issue with the "Egg Projectile" arrow trail not showing in some games. - Fixed an issue with the "Spinning Fish" win effect not appearing in most games. - Fixed an issue with Head Banners having the wrong name in the inventory. Thanks for reading! Comment below your thoughts and suggestions, we love to read them! Cuteee, HackersDontWin, Ruisdier and 33 others like this. Vqzi and Priley like this. Yeet! Thanks a lot guys for the hard work, I'm sure everyone will appreciate it! Vqzi, Kloska, Geerty and 2 others like this. Badboyoo6 and Kloska like this. Absolutely amazing, thank you so much for this update! Cool, its a really nice update! You amaze me again and again!! Thank you for lisenting to the suggestions devs! This is great! I Hope The New Upd Is Good!